To the casual traveler driving across Wyoming, the biological richness of the Sagebrush Steppe is mostly hidden. The most obvious denizens are Pronghorn (Antilocapra americana), relicts from the Pliocene with no living relatives, although an additional twelve extinct genera have been identified within their family. Famous for speed, they are capable of reaching 55 mph (88kph) in a sprint, with a normal cruising speed around 30 mph (48 kph). On the American Pleistocene plains, such velocity allowed them to outrun giant Miracinonyx cheetahs into the modern age. My friend Scott Carrier established himself as a writer by describing his efforts to run down a Pronghorn. Buy his book and see if he succeeded. Having lived in large herds during the winter, the bucks begin to establish their own territories in April. Successful males will inseminate all the does in their harem in late summer, and spend much of the intervening six months fighting off challengers, often suffering multiple horn wounds like the one seen here. Right about now (early June) the kids that were conceived last year are being born. 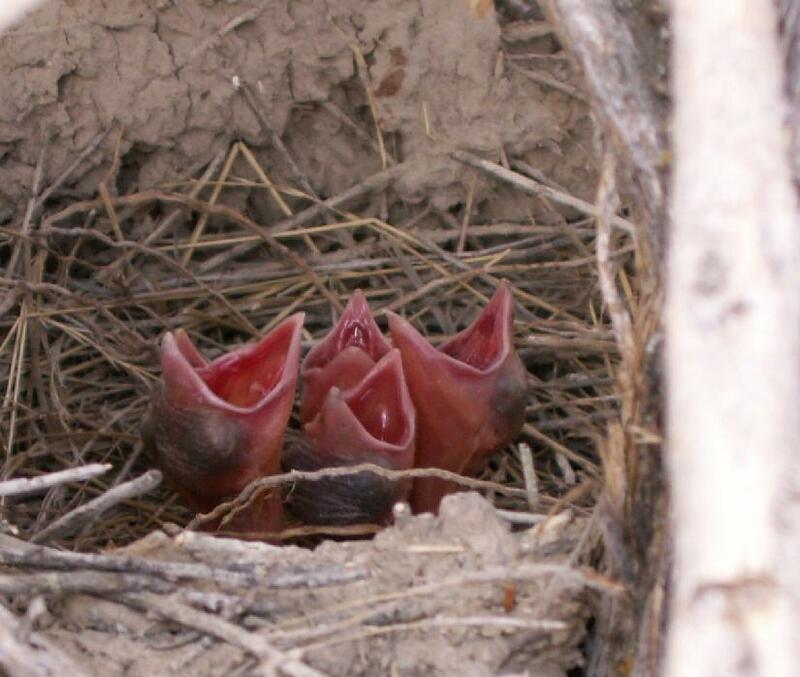 Two springs ago, I discovered a single newborn Pronghorn kid (twins are the norm, although first pregnancies usually result in single kids) in the west Utah desert. It cowered in the grasses, ostensibly lacking the strength to flee, while the entire extended family stood several yards away, staring me down. By the time the kid reaches four days of age it can outrun a human. Other artiodactyls on the Anticline include Moose (Alces alces), Elk (Cervus elaphus), Mule Deer (Odocoileus hemionus), and, I am told, White-tailed Deer (O. virginianus). Barbed wire fences, a deadly threat to large flying birds, form barriers to Pronghorn, which are unable to jump, and hurdling deer often get tangled in them. This photo shows a fence that Steve and I treated with beer cans last year, to make it more obvious to grouse. This Mule Deer died just a few feet from where we ran out of cans--statistically insignificant, but it suggests that the cans may discourage deer from jumping a fence. Despite the dangers these fences represent, many of them serve to keep sheep and cattle out of riparian areas, and ensure that livestock grazing on the Anticline maintains a low impact. The astonishing population of large raptors here is largely attributable to this little guy, Richardson's Ground Squirrel (Spermophilus richardsonii). This rodent occurs in huge numbers on the Anticline, and though it is less social than many Spermophilus species, in favorable habitat it often dwells in vast colonies. It feeds on the leaves and seeds of sage brush, grasses, and other plants, and includes many insects in its diet. Nesting Ferruginous Hawks feed primarily on this creature, and it's also an important component in the diets of other buteos, Prairie Falcons, and probably Golden Eagles. The largest member of the huge Anticline rodent community is the White-tailed Prairie Dog (Cynomys leucurus). 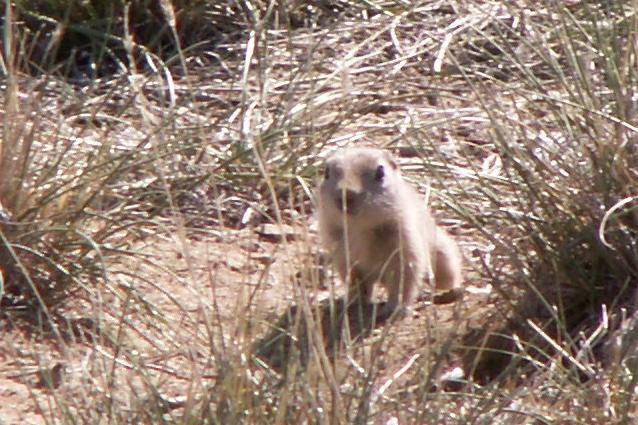 Very similar to its better-known black-tailed cousin (C. ludovicianus), it does not develop the conspicuous prairie dog "towns" of that species. The raptor population is sustained by other rodents as well, including chipmunks (Tamias spp. ), voles (Microtus spp.) and deer mice (Peromyscus spp.). One can't walk far through the sagebrush without bumping a Nuttall's Cottontail (Sylvilagus nuttalli), another item at the finest hawk diner in the West. 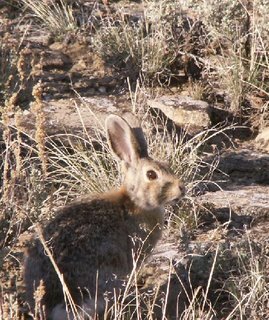 White-tailed Jackrabbits (Lepus townsendii) are also abundant, but are too powerful for any raptors to feed on regularly, except Golden Eagles, the most determined Ferruginous Hawks, and maybe an occasional Great Horned Owl that's even more psychopathic than normal. Jackrabbits are actually hares, not rabbits. One major difference between the two is that young hares are precocial, and can move about soon after birth. I've been told that Pygmy Rabbits (Sylvilagus idahoensis) also occur on the Anticline, but I've never seen one. Lest I lead you to think that rabbits are of little interest beyond hawk chow, have a look at this post by Darren Naish. The Anticline's most conspicuous mammalian predators are the Badger (Taxidea taxus) and the Coyote (Canis latrans), both of which are abundant. Long-tailed Weasels (Mustela frenata) and Striped Skunks (Mephitis mephitis) may also be encountered. On my most recent trip I saw a pied shrew that looked like a Sorex species. I've seen no evidence of cats, though they might occur. Reintroduced Wolves (Canis lupus) are beginning to show up in the area. A few years ago, a local rancher, Billy Mayo, lost a sheep to a canid. Fish & Wildlife officials inspected the kill, and said the culprit was a domestic dog. After losing his third sheep within a week, Billy mounted his snowmobile and followed the tracks, eventually catching up with a wolf, which he lassoed, and dragged back to his ranch, locking it in a trailer: an amazing feat. He called the Fish & Wildlife officials and told them to come get their "dog." The Anticline fauna is reptile-poor. I've only encountered Short Horned Lizards (Phrynosoma douglasii). Let's finish up where we started: back with the birds. The large and common Raven (Corvus corax) is the easiest bird to observe on the anticline. It's credited with being the chief predator of Sage Grouse eggs, despite a lack of data on the subject. Likewise, conventional wisdom among Wyoming locals states that Ravens haitually peck out calves' eyes, but I've yet to meet an actual witness to such an event. Ravens certainly are resourceful birds with a combination of brains and versatility, and either act is within their skill set. 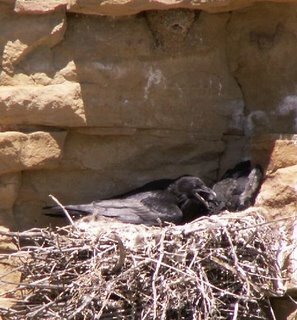 Upstairs from this hen raven and two fledglings is a Cliff Swallow (Petrochelidon pyrrhonota) nest. Both these and Tree Swallows (Tachycineta bicolor) are common along the rivers. The region's other common corvid is the Black-billed Magpie (Pica hudsonica). The kind of low trees these birds prefer to nest in are rare here, but along draws, the sagebrush can grow tall enough to provide a perfect site for their spherical mud-and-stick nests. This nest contained five chicks, maybe three days old. A number of perching bird species inhabit the Anticline; most of them stick close in the brush and are difficult to observe. 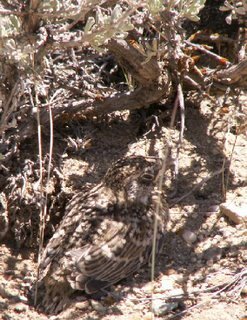 These include several sparrows, including the Sage Sparrow (Amphispiza belli), Brewer's Sparrow (Spizella breweri), Vesper Sparrow (Pooectes gramineus) and Lark Sparrow (Chondestes grammacus). 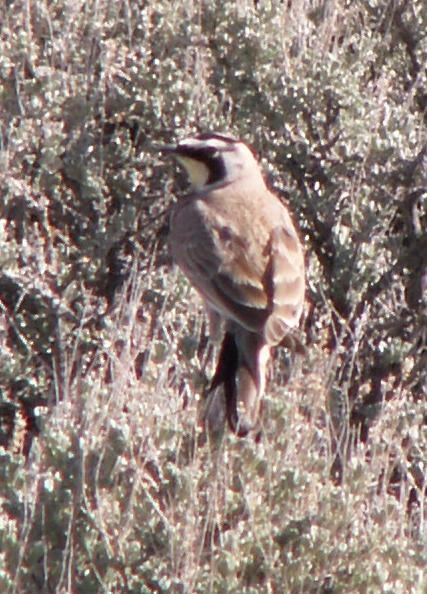 The least bashful perching bird is the Horned Lark (Eremophila alpestris), whose boldness is probably born of confidence; it is among the most athletic fliers I know. As a teenager I participated in an automobile accident that involved trying to keep up with a small group of them. Feeding on a wide range of plant and arthropod foods, they range through much of the northern hemisphere. Horned Larks build a grass nest on the ground, underneath a sagebrush. Three to five spotted eggs are laid early in April. Both parents provision the chicks, mostly with insects. 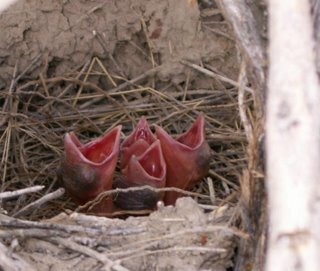 At about three weeks of age, the young larks begin to run about the vicinity of the nest. Their cryptic coloration provides some protection, but their inability to fly makes these few days the most perilous of their lives. The Sage Thrasher (Oreoscoptes montanus) is a shy and inconspicuous denizen of the sage steppes. A bit smaller than an American Robin (Turdus migratorius), it is a distant cousin of that bird. 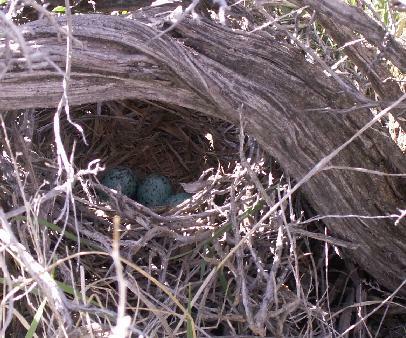 It lays its beautiful eggs in a well-built nest, deep within the confines of a thick sagebrush. The incubating female invariable slips away unseen as the nest is approached. These dry steppes are bisected by a few rivers. The riparian systems along these waterways provide a stark contrast from the surrounding country. 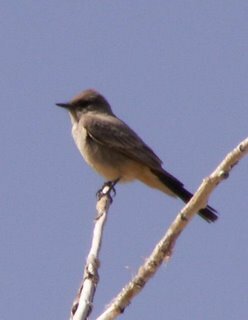 Among the most commonly seen perching riparian birds is the Western Kingbird (Tyrannus verticalis), which seeks a prominent perch from which to hawk the flying insects upon which it lives. 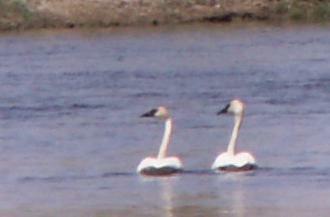 Many species of waterfowl live along these rivers, including the Trumpeter Swan (Cygnus buccinator). One hundred years ago, this huge bird was nearly extinct, but thanks to intensive management, some 15,000 individuals live today, most of them in Alaska. A number of pairs nest in this region. 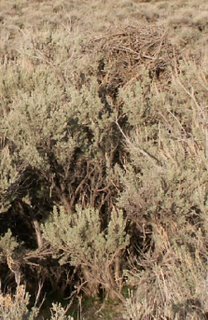 I've devoted three posts to discussing the animals of the Pinedale Anticline, but of course, the most important organism of this system is the Big Sagebrush (Artemisia tridentata). A member of the genus that gave us Wormwood (A. absynthium), and the legendary liquor absinthe, Big Sagebrush also contains complex aromatic oils that prevent most animals from feeding on it. After millions of years, a number of animals have adapted not only to feed on it, but to depend on it. It is quite possible that the camels and ground sloths that once roamed these plains were as addicted to sagebrush as their contemporary the Pronghorn. 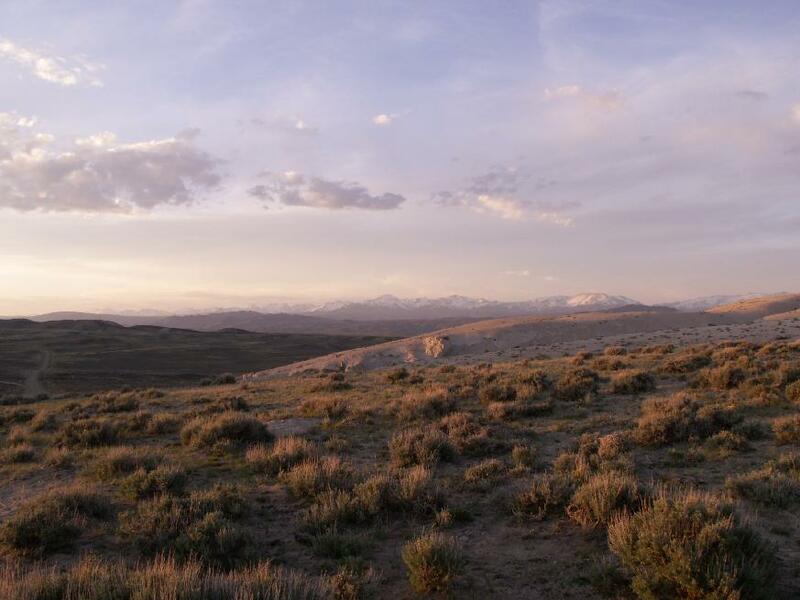 Two centuries ago, this plant dominated much of the western United States, but today just a fraction of healthy sagebrush community remains--the Pinedale Anticline represents the most vibrant remnant of sagebrush steppe. 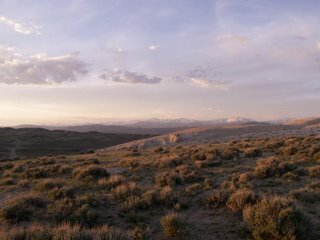 So let's say goodbye to the Pinedale Anticline for now, but hopefully not for good. The Cretaceous formation that supports these sage steppes represents the best hope the lower 48 has of substantial new petroleum extraction, and the entire region is currently under lease for gas and oil exploration. Our thirst for gasoline, the fluid that enables me to visit the place, suggests that one day the Pinedale Anticline will no longer be a domicile of jousting Pronghorns, lekking Sage Grouse and soaring Ferruginous Hawks, but of drilling rigs and howling compressors. The choice is ours. From your posts on the subject it looks like the Anticline is too open a terrain for cougars and lynx to do well on. They are found more often in sage, brush, and mixed terrain. Now, where oil drilling is concerned. I do recall all the stories about whole North Slope oil exploration would drive away the caribou. Never happened. Animals, with few exceptions, soon get used to the presence of Man, and pretty much carry on as if we weren't there. You don't bother 'em, such as deer, cape buffalo, antelope, goats, even sheep will graze yards away. As a matter of fact cape buffalo and even impala have been known to check people out. I remember episodes of a Paramount produced nature show where animals would actually chase the crew around. Including dinky little gazelle. I doubt it'll be as bad as you're making it out. Life adapts. Great series Carel. Did you have to drink all the beer to get those cans? Alan: You're absolutely right that life adapts, and some life will indeed adapt and thrive in the oil fields. I've never seen the oil fields at Prudhoe Bay. In eastern Utah there are many small gas and oil developments that have a fairly minor impact on wildlife. I wouldn't mind seeing extraction under this model, but the intensive gas development of the Jonah Field, at the south end of the Pinedale Anticline, is not a reassuring example. That little valley, which was once the biggest Sage Grouse wintering spot in the region, is forever changed, as much as any city is. Clare: Thanks. Those cans were donated by a local bar in Farson. There was a time when I could have single-handedly supplied flagging for many miles of fence, but I can only take credit for emptying a few of those cans. Outstanding stuff, really enjoyed it. 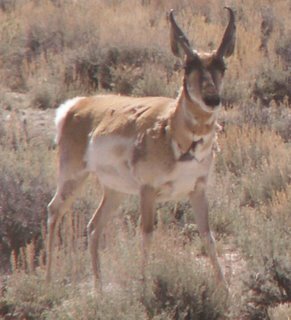 On pronghorns and their evolutionary history, have you seen John Byer's Social Adaptations and the Ghosts of Predators Past? Very worth a look. Make that Capercaillie, Tetrao urogallus. Thanks, Darren--I figured that's what you meant. It's interesting to hear that fences are a problem for European grouse, too. I've been impressed with what I've seen so far of the beer can flagging. In April '05, when we flagged 7 miles (11.8 km.) of fence, we counted an average of 15 dead grouse per mile along it. This April, we didn't find any, and the grouse population was a bit higher this year. Carel, I've greatly enjoyed reading your Pinedale Anticline Photojournal series. Wonderful photos and writing. Also very interesting about flagging the fences with beer cans. Seems like such a simple solution for a dreadful problem. Thanks, Bev. I'm glad you enjoyed it. We're still learning a lot about the best way to attach those cans so they last in the high winds that blow up there for half the year. We plan to experiment with hog rings. Great series, really makes me long to hop on I-80 and head to Wyoming. I had wondered if you might know Scott. You forgot to mention why he was trying to run down a Pronghorn, that is, to prove human bipedality is an adaptation for running down cursorial prey. I love the Miracinonyx story, but I've always thought it smacked just a bit of "just-so". Pronghorn seem to enjoy jogs that are much longer than they would need to ditch even a very persistant Cheetah at least, if the African version is any indication of general Cheetah hunting strategies. I've wondered if being able to truck along at highway speeds allows them to move efficiently between widely separated pockets of resources (water?) Published accounts of individual daily movement on the order of a couple of miles deflates that argument. Maybe they were really trying to get away from super-enduring packs of Dire Wolves? There is a wrong way to develop an oil field, and there is a less damaging way. Unfortunately the wrong way is usually the cheapest. For a bit of irony consider those huge windmill generator farms. The damn things are noisy. And it doesn't stop. Burrowing rodents living among the windmills are suffering from stress; which impacts health and fertility. I wonder what the long term impact might be. Neil: I don't think being able to run 55 mph hurts your chances of getting away from anything, including Scott Carrier. Alan: Not to mention the fact that they clobber lots of migrating birds. A bit of human activity here and there isn't a bad thing, but there just isn't a way for us to maintain exponential growth of our standard of living, "green" technology or no. I have been given pause lately by the realization, as expresseed in the last couple of comments, that renewable energy sources are not going to give us a peaceful free ride if consumption continues at its present pace, or, as all indications suggest, continues to rise. Meantime--great to see and rad about the pronghorn. I got to see a herd (herd? a male and several females)of these in a field by the transCanada highway in Alberta a few years ago. I stopped the car and got out to watch them--they weren't very shy--didn't bolt like white-tails, just ambled off in another direction, as if to say, "We're not scared of you--but we prefer not to hang around with you." I guess when you're as fast as they are you can afford to pick your moment to bolt. Really like your blog,the critters we get to see, especially the birds. As to small rodents being 'stressed' by wind generators, those critters have lots of room to move to. 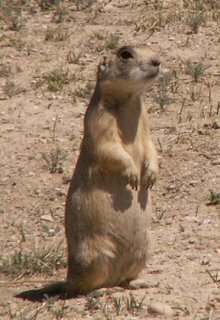 There are at least 30 prairie dogs dying daily on highway 40 out of Vernal, Utah, and at least 100 other prairie dogs eating on their remains. Have you gotten to check out the black-footed ferrets that have been released in the Dinosaur, Co. area? One other advantage of the oil and gas industry moving in is that you will get some good roads up there in Jutah. We had a less than pleasant trip in the Kelton, Utah area...Check your road map and avoid that area! Pamela: Thanks for your comments. I wish more people shared your view about energy consumption. Mary: I'm glad you enjoy the blog. I've never been to the Wolf Creek Reserve in Colorado, but should probably remedy that situation. I can't say I'm eager to make any Mephistophelean bargains for improved rural roads.